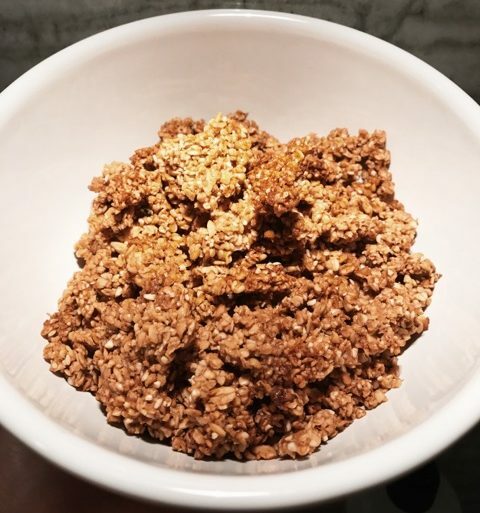 The perfect granola didn’t exist – until now! Trust me, you could easily eat a whole bowl of this stuff! If you’re as obsessed with health food as I am, then you know the struggle of looking at label after label of “healthy” snacks, only to be disappointed by the added sugars and oils that actually make them not so healthy. Granola in particular is known to be packed with TONS of sugar, vegetable oils and nuts, making it very high in calories. On top of that, being nut-intolerant made it impossible for me to find a granola in stores that is completely nut-free. After no luck, I decided to take this problem into my own hands (aka kitchen) and came up with this yummy gluten-free, nut-free granola recipe. I researched lots of existing granola recipes online to get a feel for the right amount of ingredients, which ended up mainly consisting of other healthy grains and seeds like oats, buckwheat, chia seeds, and quinoa. I tested out different mixes of those grains with my favorite natural sweeteners, organic sugar-free maple syrup and organic maple sugar, and made the perfect blend. Maple syrup is a great alternative to cane sugar and contains more beneficial nutrients (in moderation). This recipe takes less than 10 minutes to prep and about 20 minutes to bake! It will make enough granola to last a week or so, but double the recipe if you’d like to make a whole bag of granola to share with friends. Using a bowl or a mixer, combine the dry ingredients (oats, buckwheat, sugar & sea salt). Add the olive oil, maple syrup, and sunbutter into a small saucepan on medium heat and whisk for about 2 minutes until combined. Pour the olive oil/maple syrup/sunbutter mix onto the dry ingredients and mix together until even. I like using my Vitamix (aka the dream machine) to ensure that the ingredients are evenly mixed throughout. Spray the cookie sheet with a non-stick spray (I love Fourth & Heart’s Sprayable Ghee Oil) or parchment paper and lay the mixture flat and evenly onto the sheet. The more it is stuck together, the more it will come out one big chunk as opposed to little pieces – your call! Bake for about 15 minutes on 340 degrees Fahrenheit. You’ll know it’s ready to be flipped when you start to smell it and/or it turns a slight golden brown. Using a spatula, flip and the granola around the cookie sheet and cook for another 3-5 minutes. Once it is all a nice golden brown shade, let cool & enjoy for about 1-2 weeks! I can’t wait to share more of my healthy recipes with you all! Comment below with any questions about this recipe or suggestions for future ones.